Mini Ludum Dare is just like a Ludum Dare, but with rules and deadlines more relaxed. This time the theme was FUSION, creating a game that's a fusion of two other games, game genres or game ideas. First of all, for this game jam in particular I wanted to create something simple. This is because I often end up thinking of complex systems and stories and this time I wanted to exercise my brain to think of simple things. 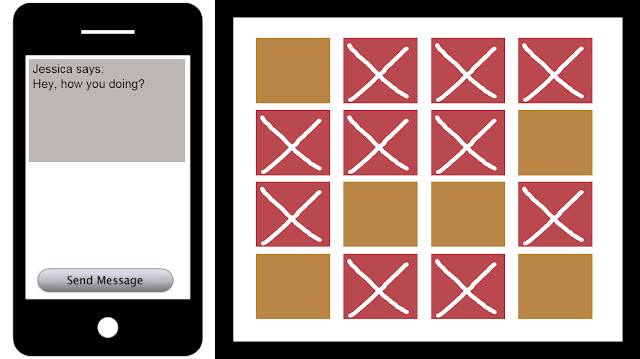 My first idea was creating a dating sim mixed with a frenetic puzzle game/clicker. You would be texting your crush and trying to take her/him out while solving puzzles. If you fail the puzzle, your cellphone connection would be lost and so your date. The puzzle has to be fast, so the main idea was: you have to solve the puzzle in order to not fail and at the same time you need to keep an engaging conversation with your crush. The core of the game was this 'resource management'. The problem with that was to create an engaging puzzle as well. In the screenshot above it works like this: brown squares are good squares and you want to avoid the red ones to completely fill the screen. To get rid of the red ones you just need to click on them, but they will keep appearing, which means it becomes a clicker game. When I run this mechanic to test, it was very boring. Othe important aspect is that, the puzzle needed to be solved using the mouse only. This is because you use the mouse to interact with the cellphone. By using a different controller to each 'screen' the 'frenetic' sensation would be lost. While thinking of a different puzzle to implement, I had an idea that led me to abandon this project and move to another game. One of the puzzles I thought for the other game was one where your had to get rid of bouncing balls by clicking some color and making other colors colide and disappear. The bouncing ball alone led me to think about the game Pong. 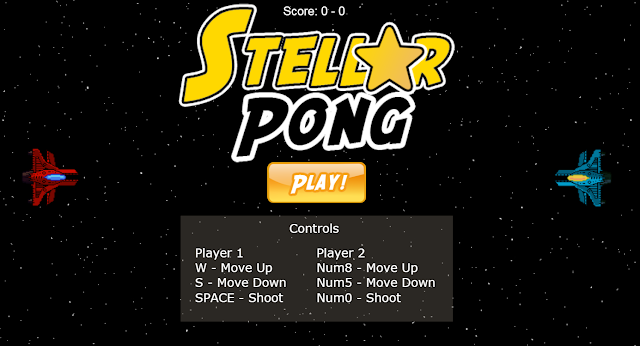 Regular Pong consists only in moving the bars and bouncing the ball back at your opponent until you score. Why not mix this mechanic with other? With this is mind, I created Stellar Pong (http://ludumdare.com/compo/minild-63/?action=preview&uid=13710). - Changing the speed of the ball. Making the ball too fast was the same as making this a game of luck: the first one to shot it right wins, since there was no time to react to that. By slowing the ball speed a little the game became a lot more balanced for both players. - Letting ships also block balls. It's basic in Pong to have something to bounce the ball off. I had a lot of problems with the collision between players and bullets and decided to make the ball only bounce off bullets. After seeing it in action, I saw that the ship's collision were extremely needed. I ended up finding a way to solve the colision issues and made it work right. - Changing the bullet design. I was using square bullets and this led to A LOT of situations where the ball would bounce backwards, making a player score a goal on himself/herself. I changed them to triangular bullets, which helped a lot. Even so, the ball can still be bounced backwards if it hits one of the corners of the bullet. However, I think this specific point must remain untouched because it rewards players that are trying to apply a strategy and kind of punishes players that play carelessly.